Piriformis syndrome is a nueromuscular condition which can cause posterior hip pain, deep buttock pain and even shooting pain down the back of the leg. Piriformis Syndrome is commonly misdiagnosed. The piriformis is a muscle located posteriorly which functions to rotate the hip. 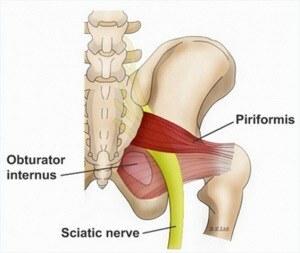 The piriformis muscle is located just superficial to the sciatic nerve. The sciatic nerve runs down the back of the leg with nerve endings leading all the way to the foot. Inflammation of the piriformis can compress the nerve causing shooting pain down the leg, numbness and tingling in the lower extremity and deep posterior buttock pain. Piriformis Syndrome can be treated with conservative measures including activity modification, physical therapy, anti-inflammatories and local ultrasound-guided injections. Occasionally it is necessary to make sure the pain is not referred pain from the lumber spine. Many patients may need to see a spine specialist at some point during management of this condition. In the rare case that a patients pririformis syndrome is not improved with conservative measures, hip arthroscopy to release the piriformis may be indicated.